It’s Halloween time again, and we’re just as excited as you are! Whether you’re staging an elaborate scene in your front yard, leading a pack of trick-or-treaters, or just waiting to hand out candy, we at D&D Plumbing want to wish you and your family lots of fun this holiday. We’ve got a few tips for you to help make your Halloween both frightful and delightful! A haunting jack-o-lantern is a Halloween highlight, the very symbol of the season, but don’t let the fun turn into a scary repair bill! Some things should never go down the drain, such as pumpkin seeds (and the stringy guts). They can do a lot of harm to your sink or garbage disposal, from clogging pipes to wrapping around or even damaging the blades. Make sure the remnants of your pumpkin carving go into the trash, instead. Better yet, you can clean and roast the seeds, and add the stringy bits into compost for the garden for a no-waste solution. When decorating for Halloween, there are a few scares you should avoid. Cobwebs, cheesecloth, and the like are very popular decorations both indoors and out, but be careful not to place them across vents where they might block airflow or even present a fire hazard. Creating your own haunted house? Mark the path, especially doors, with black light reflective tape to preserve the atmosphere while preventing mishaps. In bathrooms, it might be prudent to keep it simple and limit decoration to one or two elements. After all, nobody wants to be too scared in that situation. If you’re using dry ice to make a smoking potion in the kitchen, be extra careful to make sure you have ventilation, don’t let any chunks get into anyone’s cup, and let the smoke dissipate before you drink. Remember that Halloween can be fun, scary, and safe, all at the same time. 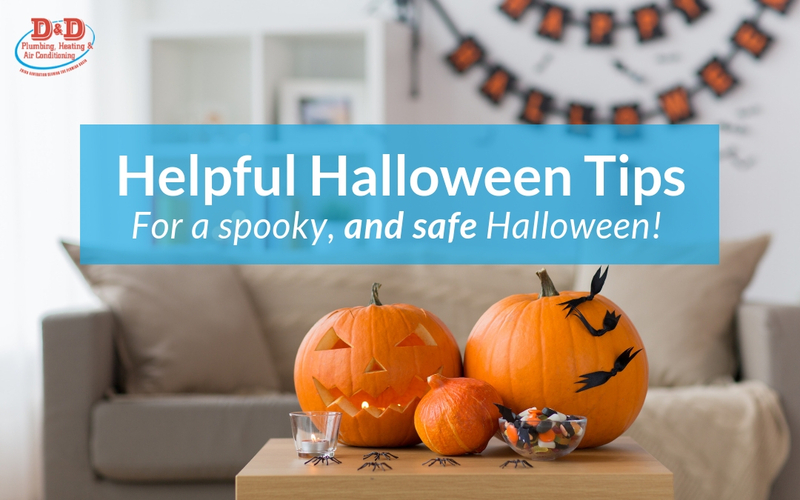 If you’re taking little ones trick-or-treating, remind them of traffic safety, and if you’ll be driving, please keep a lookout for kids who might forget to look both ways. From all of us at D&D Plumbing, have a safe and happy Halloween!